USS Nimitz (CVN-68) is a supercarrier of the United States Navy, and the lead ship of her class. One of the largest warships in the world, she was laid down, launched and commissioned as CVAN-68; "aircraft carrier, attack, nuclear powered", but she was later redesignated as CVN-68; "aircraft carrier, multi-mission", nuclear-powered", on 30 June 1975, as part of a fleet-wide realignment that year. The ship was named for World War II Pacific fleet commander Chester W. Nimitz, USN, (1885–1966), who was the Navy’s third fleet admiral. Nimitz had her homeport at Naval Station Norfolk until 1987, when she was relocated to Naval Station Bremerton in Washington State (now part of Naval Base Kitsap). Following her Refueling and Complex Overhaul in 2001, her home port was changed to Naval Air Station North Island in San Diego County, California. The home port of Nimitz was again moved to Naval Station Everett in Washington state in 2012. In January 2015 Nimitz changed home port from Everett back to Naval Base Kitsap. With the inactivation of USS Enterprise in 2012 and decommissioning in 2017, Nimitz is now the oldest U.S. aircraft carrier in service. Nimitz was authorized by the U.S. Congress in fiscal year 1967 and Newport News Shipbuilding and Dry Dock Co. in Newport News, Virginia was awarded the $106.5 million (equivalent to $800.24 million today). The keel was laid down on 22 June 1968. 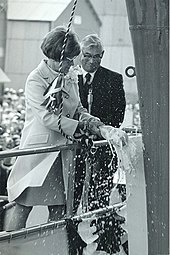 The vessel was christened on 13 May 1972 by Catherine Nimitz Lay, the daughter of the late Admiral Nimitz, six years after his death. 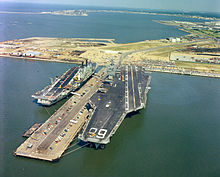 Nimitz was delivered to the Navy in 1975, and was commissioned at Naval Station Norfolk on 3 May 1975 by the 38th President of the United States, Gerald R. Ford. June 1983 to July 1984 – Complex Overhaul – forward port sponson added; 3 Mk-25 BPDMs replaced with 2 Mk-29; 3 CIWS added; SPS-49 search radar replaces SPS-43. December 1993 to January 1995 – Selected Restricted Availability – port bow catapult bridle removed. May 1998 to June 2001 – Refueling and Complex Overhaul – starboard bow catapult bridal removed; top two levels of the island replaced; new antenna mast; new radar tower; RAM replaced CIWS at forward port sponson; RAM added to aft starboard sponson; 2 CIWS at island/stern removed. On 26 May 1981, a Marine Corps EA-6B Prowler assigned to Carrier Air Wing 8 (CVW-8) crashed on the flight deck, killing 14 crewmen and injuring 45 others. The Prowler was fuel-critical after a "bolter" (missed approach), and its crash and the subsequent fire and explosions destroyed or damaged nineteen other aircraft. Despite having no connection to the accident, the media focused on the autopsy results of several members of the Nimitz's enlisted flight deck crew who were killed, who tested positive for marijuana. 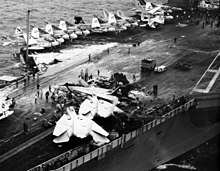 As covered by Robert Reinhold in the June 17, 1981 edition of The New York Times it was reported by "Experts at the National Institute on Drug Abuse say that it would probably be impossible to establish conclusively that any of the Nimitz crew had been smoking marijuana on the night of the crash because the test does not directly detect the component of marijuana smoke that acts on the brain. Because the metabolites may persist in the blood for many days, the test may detect marijuana that was used many days earlier long after the effects have worn off". As a result, President Ronald Reagan instituted a "Zero Tolerance" drug policy across all of the U.S. armed services, which started the mandatory drug testing of all U.S. military personnel. Nimitz deployed again to the Mediterranean on 3 August 1981. The ship, in company with USS Forrestal, conducted a Freedom of Navigation exercise in international waters in the Gulf of Sidra near Libya on 18 and 19 August 1981. On the morning of 19 August 1981, two Grumman F-14 Tomcats of VF-41 were engaged by two Libyan Su-22's, resulting in the two Libyan aircraft being shot down in what became known as the Gulf of Sidra incident. In November 2004, Nimitz was contacted by USS Princeton (CG-59), which was tracking unidentified flying objects that were capable of accelerating and maneuvering at extraordinary speeds. Princeton subsequently contacted two Navy F/A-18F fighters from Nimitz who also tracked and filmed their interactions with the objects. The incident was publicly disclosed in December 2017 with the revelation of the funding of the Advanced Aviation Threat Identification Program. Nimitz, again with CVW-11 embarked, deployed to the Persian Gulf on 7 May 2005, returning on 8 November 2005. 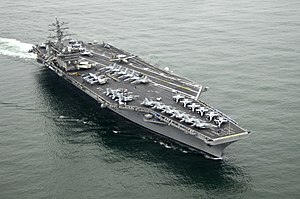 This deployment marked three decades of service, and was depicted in the Emmy award-winning 2008 PBS documentary series Carrier. In June 2006, Nimitz was awarded the 2005 Battle "E". The BBC reported that Nimitz was located in the Persian Gulf, ready to contribute to an operation against Syria when President Obama ordered a military strike. Two days later it was reported that the carrier and its task group had been re-routed westwards across the Arabian Sea. On 1 June 2017, Nimitz left Naval Base Kitsap for her next scheduled deployment. This deployment was against ISIS in Iraq and Syria. Her F/A-18s played an important role in the Battle of Tal Afar, providing precision air support for advancing Iraqi soldiers. On 1 March 2018, Nimitz Entered dry dock at Puget Sound Naval Shipyard for ten months of overhaul. The Nimitz-class carriers have a lifespan of approximately 50 years. Nimitz herself is projected to be replaced around 2022 by the Gerald R. Ford-class aircraft carrier USS John F. Kennedy (CVN-79). The exact date of the ship's inactivation and decommissioning will likely depend on Defense Department funding considerations. The Final Countdown, a 1980 alternate history science fiction film about a modern aircraft carrier that travels through time to the day before the 1941 attack on Pearl Harbor, was set and filmed on board the real-life USS Nimitz. The PBS series Carrier followed the May-November 2005 deployment of Nimitz to the Persian Gulf, documenting the life and shipboard routines of the crew over 10 episodes. On the 10th episode, in the third season of the TV-series "Friends", the USS Nimitz is mentioned as the carrier where a 19-year-old girl in a girl scout uniform out-sells Ross Geller in selling girl scout Cookies, with her selling over 2000 boxes. ^ Polmar, Norman (2004). The Naval Institute Guide to the Ships and Aircraft of the U.S. fleet. Annapolis, Maryland: Naval Institute Press. p. 112. ISBN 978-1-59114-685-8. ^ Slade, Stuart (29 April 1999). "Speed Thrills III – Max speed of nuclear-powered aircraft carriers". NavWeaps. Retrieved 10 January 2012. ^ "Nimitz finally arrives for long maintenance period". Kitsap Sun. 13 January 2015. Archived from the original on 7 October 2015. Retrieved 16 September 2015. ^ a b "Nimitz". Dictionary of American Naval Fighting Ships. Navy Department, Naval History and Heritage Command. 8 May 2009. Retrieved 28 April 2015. ^ Cassatt, Josh (4 October 2011). "HSM-75 25th anniversary" (Press release). San Diego, California: Navy Public Affairs Support Element. Navy News Service. Retrieved 10 January 2012. ^ "ASN Wikibase Occurrence # 77226". Aviation Safety Network. Aviation Safety Network. Retrieved 20 December 2016. ^ Gero, David (1999). Military Aviation Disasters. Yeovil, UK: Patrick Stephens, an Inprint of Haynes Publishing. pp. 131–132. ISBN 1-85260-574-X. ^ Reinhold, Robert (17 June 1981). "Congressman Says Most Killed in Nimitz Crash Showed Traces of Drugs". The New York Times. ^ Ackerman, D. L. (1991). "A History of Drug Testing". In Coombs, Robert H.; West, Louis Jolyon (eds.). Drug testing: Issues and options. Oxford, UK: Oxford University Press. pp. 3–21. ISBN 978-0-1950-5414-9. ^ a b Pritchett, Raymond (blogging as Galrahn) (27 August 2009). "The Monster Myths of the CVL Concept". United States Naval Institute. Retrieved 20 July 2011. ^ Jewell, Angelyn et al., pp. 5–6. ^ Jewell, Angelyn et al., pp. 146–149. ^ a b "USS NIMITZ CVN 68". US Carriers. Retrieved 28 April 2015. ^ DeHoux, Kristine (7 April 2003). "Nimitz Carrier Strike Group Joins Others Deployed to 5th Fleet" (Press release). USS Nimitz, at sea: USS Nimitz Public Affairs. Navy News Service. Retrieved 30 May 2010. ^ Arendes, Ahron (19 April 2004). 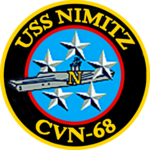 "Nimitz Earns Coveted Battle "E"" (Press release). North Island, California: USS Nimitz Public Affairs. Navy News Service. Retrieved 30 May 2010. ^ Arendes, Ahron (3 June 2004). "Nimitz, CVW-11 Win 2003 Flatley Award" (Press release). North Island, California: USS Nimitz Public Affairs. Navy News Service. Retrieved 30 May 2010. ^ Cooper, Helene; Kean, Leslie; Blumenthal, Ralph (16 December 2017). "2 Navy Airmen and an Object That 'Accelerated Like Nothing I've Ever Seen'". The New York Times. Retrieved 17 December 2017. ^ Commander, U.S. Third Fleet Public Affairs (9 May 2005). "USS Nimitz Strike Group Deploys" (Press release). San Diego, California. Navy News Service. Retrieved 30 May 2010. ^ Riveracorrea, Alexia M. (23 April 2008). "Nimitz Highlighted in PBS TV Series and Premiere" (Press release). North Island, California: Fleet Public Affairs Center, Pacific. Navy News Service. Retrieved 2 August 2012. ^ Crosser, Felix (9 June 2006). "Nimitz Named Best in Pacific Fleet" (Press release). San Diego, California: USS Nimitz Public Affairs. Navy News Service. Retrieved 30 May 2010. ^ Nimitz Carrier Strike Group Public Affairs (22 May 2007). "Nimitz Carrier Strike Group Arrives in 5th Fleet" (Press release). USS Nimitz, at sea: US Navy. Navy News Service. Retrieved 30 May 2010. ^ "USS Nimitz not known to be carrying nuke warheads". The Times of India. New Delhi, India. 26 June 2007. Retrieved 28 April 2015. ^ Diaz, Dustin Q. (2 October 2007). "Nimitz Returns to San Diego Following Successful Deployment" (Press release). San Diego, California: USS Nimitz Public Affairs. Navy News Service. Retrieved 30 May 2010. ^ Commander, U.S. 3rd Fleet Public Affairs (18 January 2008). "Nimitz Carrier Strike Group Set to Deploy" (Press release). San Diego, California. Navy News Service. Retrieved 10 January 2012. ^ Nizza, Mike (12 February 2008). "U.S. Carrier Intercepts Russian Bombers". Retrieved 16 September 2015. ^ Commander, U.S. 3rd Fleet Public Affairs (28 July 2009). "Nimitz Strike Group Set To Deploy" (Press release). San Diego, California. Navy News Service. Retrieved 10 January 2012. ^ USS Nimitz and USS Ronald Reagan Public Affairs (21 September 2009). "USS Nimitz Launches First Sorties, Support Coalition Troops in Afghanistan" (Press release). Gulf of Oman. Navy News Service. Retrieved 10 January 2012. ^ Liewer, Steve (12 January 2010). "Meritorious Unit Honor Presented To Nimitz Crew". San Diego Union-Tribune. ^ "China decries Barack Obama's plan to meet Dalai Lama". BBC News. 12 February 2010. Retrieved 2 March 2010. ^ "Chiến hạm Hoa Kỳ ghé Hong Kong cùng lúc đức Đạt Lai Lạt Ma tới Hoa Kỳ" [US warships visit Hong Kong at the same time the Dalai Lama to the United States] (in Vietnamese). Archived from the original on 21 February 2010. ^ Department of Defense (9 December 2010). "Navy Announces USS Nimitz Homeport Change to Everett, Wash" (Press release). Washington, DC. Navy News Service. Retrieved 11 December 2010. ^ "USS Nimitz moves to Everett, Washington". WWLP. 9 December 2010. Archived from the original on 2 April 2011. Retrieved 9 December 2010. ^ David, Vanessa Y. (9 March 2012). "Nimitz Completes Sea Trials, Arrives at New Homeport" (Press release). Everett, Washington: USS Nimitz Public Affairs. Navy News Service. Retrieved 20 March 2012. ^ Fiege, Gale (9 March 2012). "USS Nimitz brings 2,800 sailors to Everett". The Herald. Retrieved 2 August 2012. ^ "MV-22 Osprey Flight Operations Tested Aboard USS Nimitz". 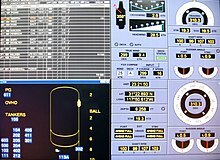 Avionics Intelligence. PennWell Corporation. 9 October 2012. Retrieved 9 October 2012. ^ Candelario, Renee (8 October 2012). "MV-22 Osprey Flight Operations Tested Aboard USS Nimitz" (Press release). USS Nimitz, at sea: USS Nimitz Public Affairs. Navy News Service. Retrieved 9 October 2011. ^ Bowen, Jeremy (30 August 2013). "France's Hollande backs US on Syria action". BBC World Service. Retrieved 28 April 2015. ^ Shalal-Esa, Andrea (1 September 2013). "USS Nimitz carrier group rerouted for possible help with Syria". Washington, DC. Reuters. ^ Simoes, Hendrick (22 October 2013). "USS Nimitz sent to Mediterranean". Stars and Stripes. Manama, Bahrain. ^ "Nimitz to Operate in Mediterranean". 648. U.S. Naval Forces Europe-Africa/Commander, U.S. 6th Fleet Public Affairs. 21 October 2013. Archived from the original on 29 October 2013. Retrieved 27 October 2013. ^ de Leon, John (16 December 2013). "USS Nimitz returns to Everett after 9-month deployment". The Seattle Times. Everett, Washington. Associated Press. Retrieved 28 April 2015. ^ Agee, Kelly (20 October 2014). "Nimitz to Participate Alongside Canadian, Japanese, other US Ships in Task Group Exercise" (Press release). San Diego, California: USS Nimitz Public Affairs. Navy News Service. Retrieved 4 December 2014. ^ Naval Air Forces, Public Affairs (3 November 2014). "F-35C Completes First Arrested Landing aboard Aircraft Carrier" (Press release). San Diego, California. Navy News Service. Retrieved 28 April 2015. ^ Majumdar, Dave (3 November 2014). "U.S. Navy Version of F-35 Lands on Carrier for First Time". USNI News. U.S. Naval Institute. Retrieved 28 April 2015. ^ Commander, Naval Air Forces Public Affairs (17 November 2014). "F-35C Completes Initial Sea Trials aboard Aircraft Carrier" (Press release). San Diego, California. Navy News Service. Retrieved 4 December 2014. ^ Herald staff (24 June 2014). "Nimitz moving to Bremerton for 16 months of maintenance". The Herald. Everett, Washington. Retrieved 4 December 2014. ^ "USS Nimitz, USS Shoup and USS Kidd Depart for Deployment". United States Navy. 1 June 2017. Retrieved 2 June 2017. ^ Cooper, Helene (2 September 2017). "ISIS Is on Its Heels, but Fighting to the Death". The New York Times. ^ Stanford, Julianne (1 March 2018). "USS Nimitz enters shipyard's dry dock for a year of maintenance". Kitsap Sun. ^ O'Rourke, Ronald (7 August 2017). "Navy Ford (CVN-78) Class Aircraft Carrier Program: Background and Issues for Congress" (PDF). Congressional Research Service. Retrieved 10 September 2017. ^ Canby, Vincent. " 'The Final Countdown' (1980) - Carrier Nimitz stars in 'Countdown'". The New York Times, August 1, 1980. Boullianne, Edmond L. (13 May 1997). "Carrier Air Wing Surge Operations: A Revolution in Strike Warfare" (PDF). Joint Military Operations Department. Newport, Rhode Island: United States Naval War College. Retrieved 20 July 2012. Jewell, Angelyn (1998). USS Nimitz and Carrier Airwing Nine Surge Demonstration (PDF). Alexandria, Virginia: Center for Naval Analyses. CRM 97–111.10/April 1998. Archived from the original (PDF) on 19 October 2013. Schank, John F.; Arena, Mark V.; Rushworth, Denis; Birkler, John; Chiesa, James (2002). Refueling and Complex Overhaul of the USS Nimitz (CVN 68): Lessons for the Future. Santa Monica, California: Rand Corporation. ISBN 0-8330-3288-7. Retrieved 4 December 2010. This page was last edited on 20 April 2019, at 13:09 (UTC).